B.V .1.2- Apply the Elements of Art and Principles of Design to create art. B.V .1.4- Recognize how Elements of Art and Principles of Design are used in art. B.CX.1.4- Interpret art in terms of cultural and ethnic context. 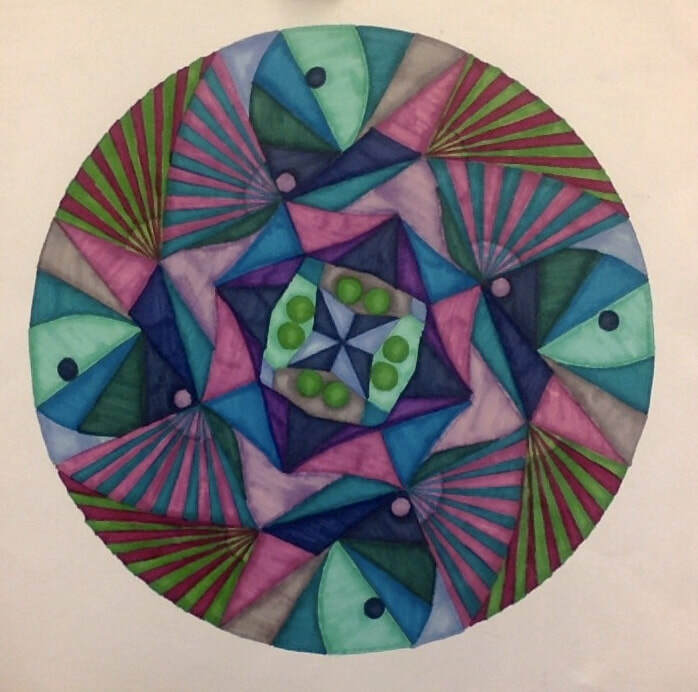 create a mandala that uses Line, Shape, and Color to create Radial Balance, Unity, and Pattern. Mandala- Mandala means Circle. These designs tend to be in a circular format and are normally filled with patterns. One reason Tibetan monks create mandalas is for mediation and focusing. Traditional mandalas are made with sand and take about 5-7 days, people travel from all over the world to watch the monks create their designs. After they are finished they sweep up the sand and spread it over water to symbolize the impermanence of life. Generating Ideas - Think about the direction you want to go in with your project, and try to make it as unique as possible. Will your shapes be geometric, organic, or a combination of both? Will your lines be straight, curvy, thick, thin, jagged, etc. the things you see everyday and things that are important to you! the line drawn in the very center. This will prevent the need to erase the line later. freehand the design as it moves out. section to help keep sections the same. with a ultra-fine black sharpie. - When filling in design with color, make sure you are using the correct marker techniques!! Ask 3 people what is working and what needs to be improved and make any changes as necessary. whole paper is filled with patterns and your mandala. your hand to prevent smudging.